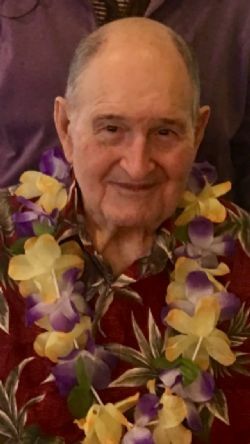 John T. (Buddy) McLure, Jr., 84, of Freeport, Texas went home on his birthday, January 23, 2019. Buddy was born Jan. 23, 1935 in Mumford, Texas to J.T. McLure and Milada Veronika Rosenkranz McLure. He served in the U.S. Army. Buddy was a member of Jones Creek Baptist Church. He retired from Dow Chemical as a fireman EMT after 36 years of service. Buddy enjoyed photography, fishing, road trips, and music especially his polka music and dancing. He was preceded in death by his wife of 43 years, Jo Beth McLure, daughter, Rebecca McLure-Crocker, and his parents. Buddy is survived by two children: Veronica Thomas and husband Roger (Rocky) of Jones Creek, John T. McLure III and wife Lorrie of Brazoria, 5 grandchildren: Roger (Rocky) Thomas, Jr, Bradley Thomas, Anthony McLure, Corey Thomas, Morgan Sponable, 5 great grandchildren: Kyla, Harper, Hudson, Conner, and Aria, sister, Mattie Nichols of Iowa Colony and numerous nieces, nephews, other relatives and friends. The family will receive friends 5pm until 7pm Sunday at Lakewood Funeral Chapel. Funeral services will be 10:30am Monday, January 28, 2019 at Lakewood Chapel with Rev. Brent Pittman officiating. Interment will follow at Restwood Cemetery. Pall Bearers will be: Rocky Thomas, Jr; Bradley Thomas, Anthony McLure, Corey Thomas, Matt Sponable, and Billy Crain. Donations may be made in his memory to Jones Creek Baptist Church, Parkinson's Foundation, or the American Cancer Society. The family wishes to thank the staff at Elmcroft Senior Living, Oak Village Health Care, and CHI St. Lukes Brazosport I.C.U. Buddy loved spending time with his family, especially his grandchildren and he will be missed by all who know and loved him.